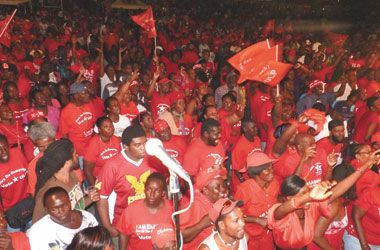 Prime Minister Dr. Ralph Gonsalves expressed this sentiment on Sunday, March 27, at the Unity Labour Partyâs (ULP) rally at Rabacca, to celebrate its 10th anniversary in government. Gonsalves disclosed that the fundamental principle of this countryâs foreign policy is to enhance St. Vincent and the Grenadinesâ capacity with its external environment, in the interest of the people of this country. âI understand that the Opposition is trying to make an issue of us having diplomatic relations with Libya. âI make that point with absolute clarity, so that in the case of Libya, whichever government emerges in Libya, we will have relations with that government. That is the position of the government of St. Vincent and the Grenadines,â said Gonsalves. The Prime Minister noted that although some countries have taken certain positions regarding the conflict in the North African country, they have not cut ties with Libya. He said that this country does not choose its friends according to who its enemies are. âJust like in Portugal. We have diplomatic relations with Portugal; we are getting laptops from the government of Portugal. The current Prime Minister has lost his office; he is my friend,â said Gonsalves. âIf in the elections he loses, there will be another government and another prime minister and I will deal with that other government and that other prime minister. That does not mean that the one who was my friend that I should treat him like my enemy,â said Gonsalves. He contended that there are a lot of people who donât understand the sophisticated nature of foreign policy. Gonsalves stated that a genuine cease fire is needed in Libya, as well as an international conference to ensure that there is a resolution to the conflict.